This award-winning telescope is ideal for serious newcomers to astronomy, as it combines both high quality optics with an affordable price. This telescope was Group Test Winner (BBC Sky at Night) and awarded Best Budget Buy by the Independent Newspaper. The SKYHAWK-1145P models feature premium-quality Parabolic Primary Mirrors, normally found in larger more expensive telescopes, to eliminate spherical aberrations, producing even sharper, higher-contrast images which are full of detail. A parabolic, or more accurately a paraboloidal mirror, is ground to a shape which brings all incoming light rays to a perfect focus, on axis. In addition they feature 0.5mm Ultra-Thin secondary mirror supports, to reduce diffraction spikes and light loss. Magnifications (with optics supplied): x20, x40, x50, x100. Highest Practical Power (Potential): x228. 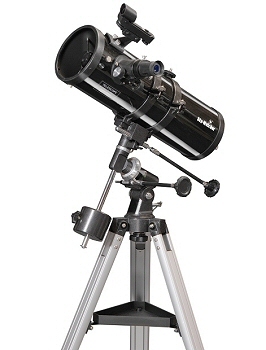 Supplied with a high-quality motorised equatorial mount, enabling you to track automatically objects in the night sky. Our SkyHawk 1145PM Telescope is a 'reflector' telescope (sometimes called a 'reflecting' telescope). Reflector telescopes use a concave mirror to collect the light coming from the object being oberved (eg the moon), and reflect this up to the eyepiece. The most important thing to look for in a telescope is the quality of the lenses and mirrors. Generally speaking, for a reflector telescope, the larger the diameter of the main mirror, the more light can be collected, and hence the greater the quality of the magnified image. Usually, the more you pay, the higher the quality of the magnified image. This is not always the case though among the telescopes we regularly review.The attractive SkyHawk 1145P telescope benefits from Sky Watcher's Aspherical Technology, usually only found in larger, more expensive telescopes. The primary mirror is altered during polishing to bring the light rays onto a common focal plane, resulting in sharp images full of detail. Using this technology, the SkyHawk 1145P telescope can therefore boast about having what is known as a parabolic mirror, rather than inferior spherical mirrors used on (as far as we know) every other telescope in this category. The result is that the SkyHawk 1145PM produces remarkably bright and clear images. Its intuitive manoeuvrability makes it a perfect user-friendly telescope. Setting up the telescope is easy.What we also particularly like about the SkyHawk 1145PM telescope is that it achieves a very good trade-off between quality and price. The magnification of 100x may seem low in comparison to quoted magnifications of other telescopes, however this enables the SkyHawk 1145PM to offer a wide range of view and this is all done with optics that are superior in quality to all other telescopes in this price bracket. The result is that the SkyHawk 1145PM provides particularly clear and bright images that reveal more in the night sky than other telescopes quoting higher magnifications, which commonly suffer from poor-quality, low-detailed and dull images with such a narrow field of view that proper observation is impossible.The SkyHawk 1145P enables amateur astronomists to discover a wealth of hidden secrets in the night sky, without costing the earth! And, we have to admit, the remarkable quality of the images makes this telescope stand out from other telescopes in this price range.